The work, usually in very small groups, or one-on-one as in this short clip, was fascinating. 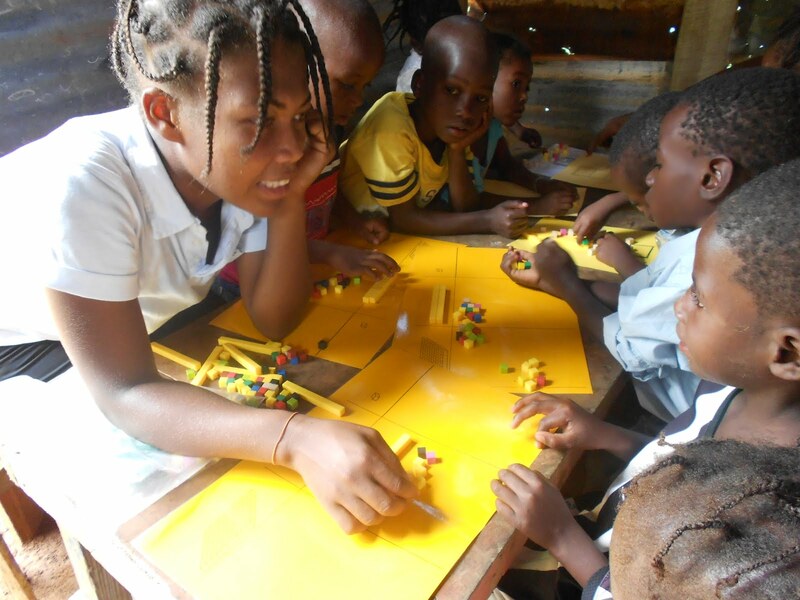 The children were confronted with very novel stimuli; they learned quickly and created new games with the materials. Here Sorting dot cards Dieula helps me prepare by sorting groups of small dot-cards - she called them "dominos" as that is what they resemble. Below, Jezilen discovers she can successfully play "bingo" and match 3-letter English words! Her friends were also astonished, as she has never gone to school, didn't want to. But, "pattern recognition," ah, she was very keen at that. Indeed, to be able to detect the color of various Haitian money bills, it is an essential capacity to develop. This task builds on our natural abilities of perception, detection of discrepancy, and patterns. Vwala! And...there's more. The elation at discovery was something I could document, to my own elation! Bella understands that letters and words are written here in the New York Times, and she points to them, muttering to her 5 year old self....something. Ah, Watkliff, a budding engineer! Children had access to these materials and were very creative for hours , if we allowed it. In more structured tasks, they were ask to re-create or copy a pattern by matching shapes to a template. Being understaffed, it proved advantageous and interesting to train and deploy older adolescents to interact with the young students and the materials. It was hot if not raining, poorly lit unless we had spots by a door. If it rained, well, you could hardly hear yourself think. We pushed on. Whew!